Successfully Added Keychain Ultraviolet (UV) Level Detector with Digital Display to your Shopping Cart. 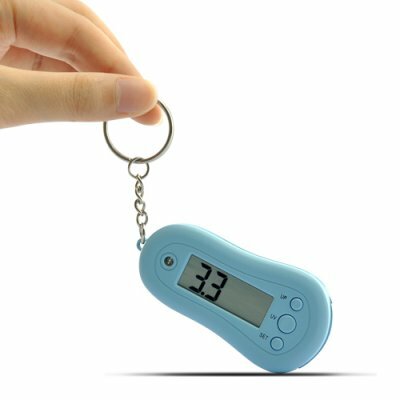 Keychain Ultraviolet (UV) Level Detector with Digital Display: Detect and be aware of the irreversible damage sunbeams may be causing you! The sun is vital for life, but too much is also dangerous for human beings. Ultraviolet (UV) rays can cause skin aging, sunburn, and skin cancer. Unfortunately, our eyes are not able to determine accurately the intensity of UV radiation, especially during cloudy and snowy days. With the UV Detector, you get an easy way to quickly and precisely measure this UV intensity. Thus, when UV rays exceed dangerous limits, you can take proper steps to protect your skin and eyes, as well as your kids'. The Keychain Ultraviolet Level Detector is convenient to carry with its lightweight and tiny dimensions, so take it with you for your next summer holiday, outdoor gathering, and so on. It is also very easy to use. Simply leave it under the sunshine for a few seconds and the result shows up with high reliability on the digital display. With the UV detector, you know exactly if you need a pair of sunglasses, sun cream, sun cap, and other stuff to be well protected from sunbeams. In other words you are sure to spend a good time without risking any skin or eye damage! The Keychain Ultraviolet (UV) Level Detector follows the motto "The best cure is prevention". This great device is offered at an amazing low price, for single and bulk order purchases, and brought to you by the online leader in gadgets and electronics, Chinavasion. Helps you avoid exposing your skin under harmful UV rays! This device is helpful for preventing skin and eyes from sun-related dangers and diseases.